Of all the pictures I took at Mesa Verde National Park, this was one of the most difficult. To see Square Tower House, you have to sort of lean over a railing, and look into a canyon. This building seems to be built into the corner of a canyon. Additionally, nothing I did conveyed the beauty of the place – it was really hard to get the lighting corrected to show the colors and the details. Final editorial choice is obviously the b&w, which I think does the job rather nicely. 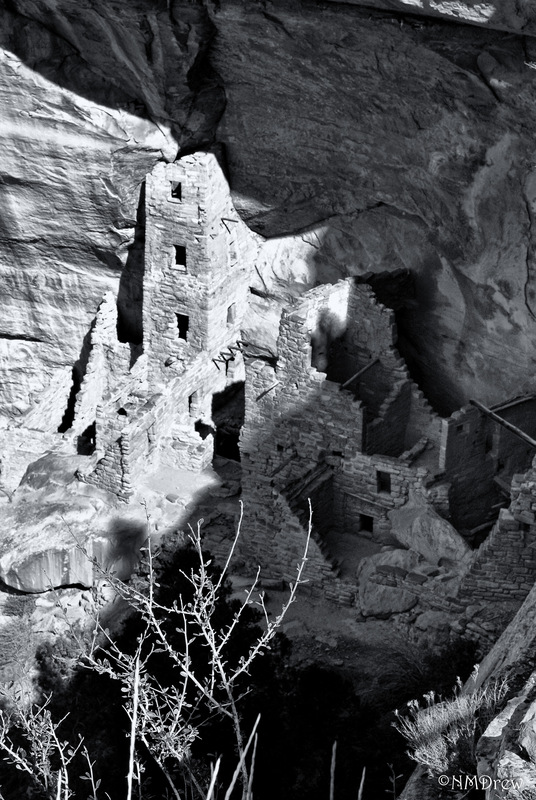 This entry was posted in Glimpses and tagged "photography", B&N, black, black and white, BW, cliff dwelling, Colorado, Mesa Verde, Nikon V1, Square Tower House, white. Bookmark the permalink. yes I agree, fab details, what an amazing place. I posted my pictures of Cappadocia on the film blog, it really reminds me of here.